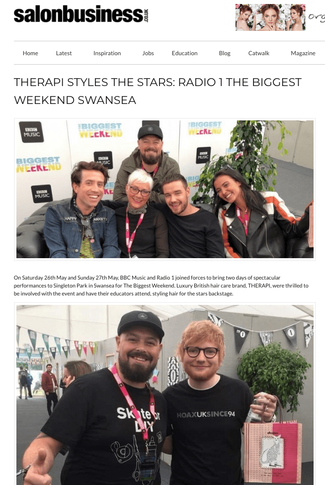 TRADE MAGAZINES FEATURE THE NEWS OF THERAPI AT RADIO1 THE BIGGEST WEEKEND. Trade Magazines, Hairdresser's Journal and Salon Businesss, feature the news on THERAPI Educators, Andy McClintock from The Attic Experience in York and Adam Brady from Boab Hair and Beauty in York, attending the Radio 1 The Biggest Weekend to style hair for the celebrities using THERAPI products. 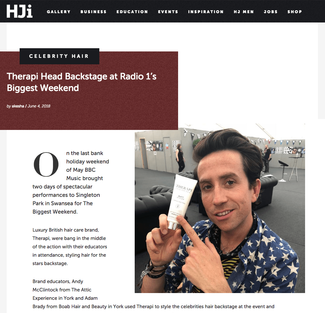 Both pieces also mention that as well as styling the hair backstage for the celebrities, the educators also gifted backstagers with THERAPI products to keep their hair looking and feeling great post-festival. You can read the full Hairdresser's Journal article here and the full Salon Business article here.